With Message Performance, Sailthru Mobile gives you the ability to measure the impact of your messaging strategy by tracking events such as conversions and app opens as a direct result of a push notification. When you send a push notification, we keep track of how that notification influenced people to open your app. Influenced opens can be direct or indirect. Direct opens track how many opens occurred as a result of tapping a notification if the app is not already open. These are shown as the darker gray bars. Indirect opens track how many opens occurred as a result of seeing the notification (for example, people who saw a notification and opened the app from the app drawer or home screen). These appear as the lighter grey bars. 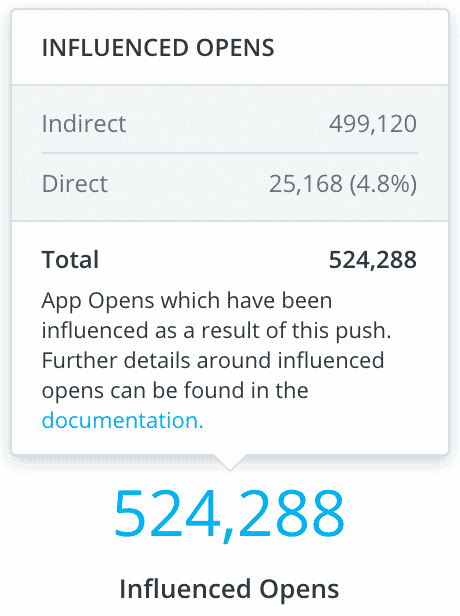 This metric is not unique, meaning if a user opens the app indirectly twice within the attribution window, this will count as two indirect opens. While Indirect opens are only tracked within a 12-hour attribution window, Direct opens will be attributed no matter when they happen – if a user has a notification sit in their tray for 3 days, and then they tap on that notification, it will still count as a direct open. When you track events from your app, you can directly attribute conversions and actions as a result of an influenced open. To do so, simply define and track your custom events in your app’s logic, and we will surface the top 25 events in the Custom Events/Conversions section of Message Performance. 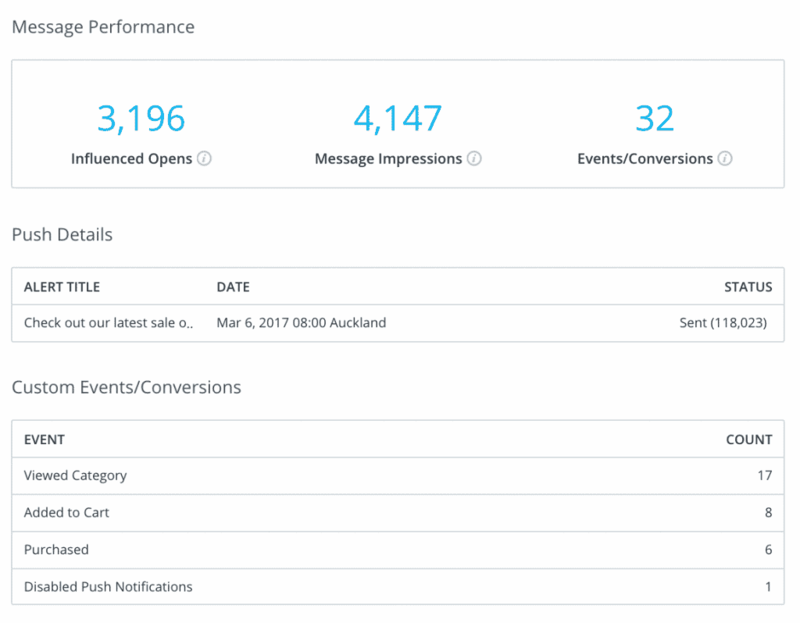 These events are automatically sorted by count (high to low), so you can easily identify the best performances in terms of conversions. Custom Events and Conversions are tracked within a 24-hour attribution window. All events and influenced opens are measured with a ‘Last Push Win’ attribution model. This allows you to measure the effectiveness of the most recent notification touchpoint people interact with. Events will be always be attributed to the last push notification received for that user over a 24 hour period. 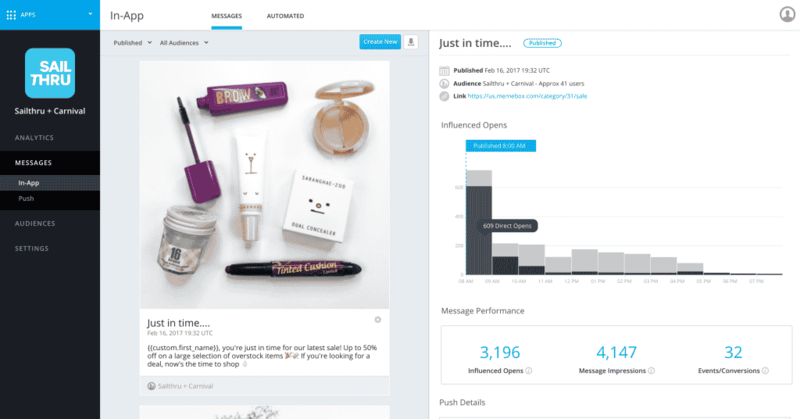 You can use Influenced Opens to iterate over your push creative and send time so you can better reach people based on how they react to your messaging strategy. Start by establishing a baseline for your current push performances. You can do so by measuring Influenced Opens over a period of time to define an average rate. You can then iterate and improve every step of the way. Make sure to captivate users with a copy that makes the user want to open your app. Be relevant and contextual. Send notifications when users are most likely to see and open them.